A spectacular statement piece, The Ascot Oak Dining Chair Mink Velvet is a great addition to the home. A contemporary take on a classic style, the Ascot Oak Dining Chair is surprisingly versatile and is designed to impress in a variety of spaces. 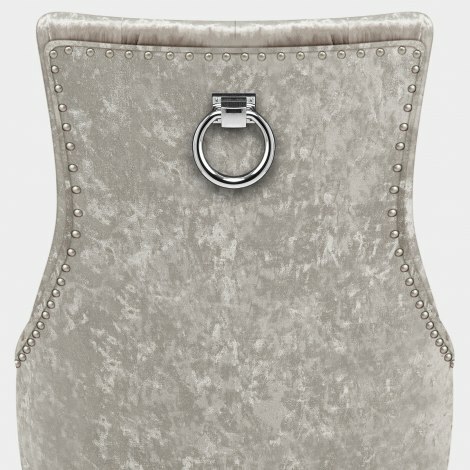 A belted seat pad upholstered in trendy mink velvet, and a high backrest featuring decorative quilted button detailing allows you to dine in comfort. For a touch of glamour, the seat is edged with chrome studs and the rear is complete with a stylish chrome ring. Fashioned from solid wood, the four legs have a classic polished oak finish and are complete with protective floor plugs to keep your floors looking great. "Very good quality, best delivery service"
What a find! This chair is beautiful. Elegant. Comfortable. 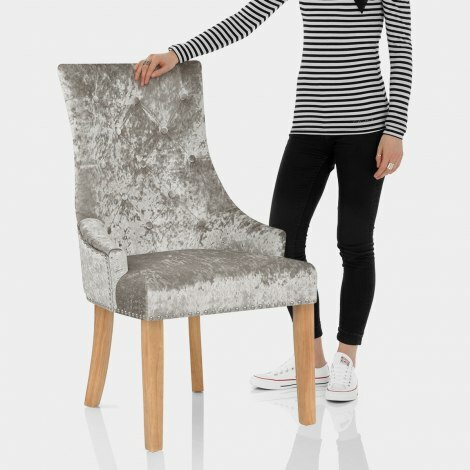 Looks very expensive, but at half the price of similar chairs on other websites. Ordered 2 for bedrooms, but am so impressed I am going to order more to replace my dining chairs. They are gorgeous. First class service, delivered next day. Easy to assemble instructions and beautiful classy looking chairs.